Don’t worry, you don’t have a case of déjà vu. I know that this car looks a lot like the Mazda CX-5 review I wrote last week, but its not! 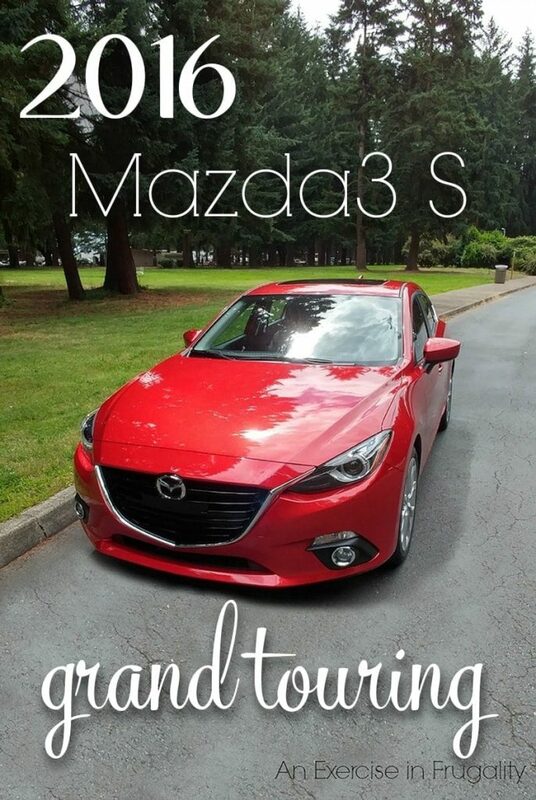 Say hello to the CX-5’s cute little cousin, the Mazda3 S Grand Touring! There’s a whole lot to love about this car, and love it we did. Don’t let it’s size fool you, this car might look sweet, but she is also mighty fun to drive! First of all, its the same color as the CX-5: Soul Red Metallic. Normally I’m a neutral color fan when it comes to cars. Give me black, white, gray or silver any day but this….this red speaks to me. This red started to grow on me last week, and now to have another car this week in the same color, I’m totally sold. Now of course, color isn’t everything when it comes to cars, and it’s also not everything the Mazda3 has in common with its cousin the CX-5. This model has the same engine as the CX-5 which is the 2.5L 4-cylinder engine with Skyactiv Technology in a smaller body. That means this little car has some pep! The SkyActiv engine is engineered for best performance without compromising fuel economy, and the result is a great drive AND better gas mileage. The particular car I got to test drive was a manual transmission. I’ll just be straight forward here-it was FUN to drive. I know not a lot of people know how to drive a stick shift these days, but let me tell you once you get the hang of it, it makes driving a whole lot more enjoyable! 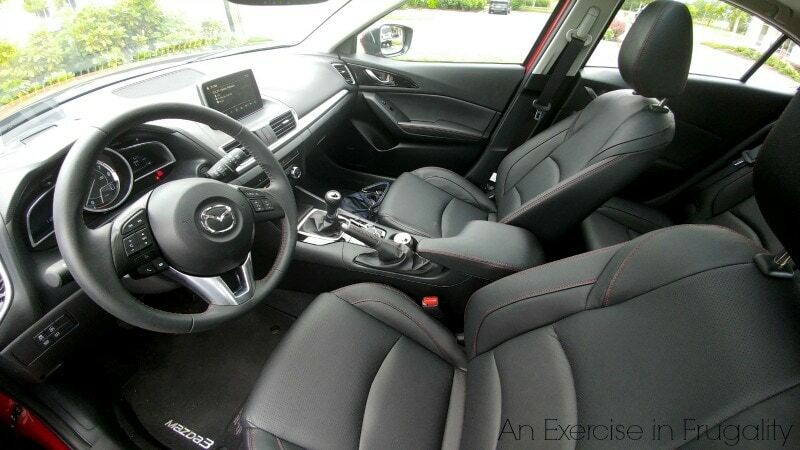 The leather seats have a gorgeous red stitching detail that echos the beautiful hue of the exterior paint. The back seat is surprisingly roomy. 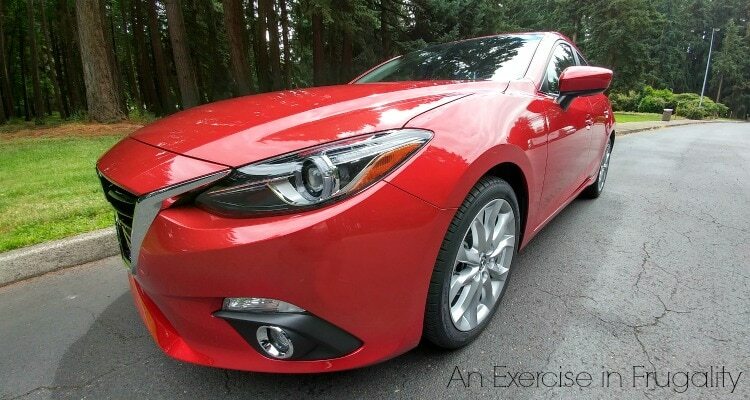 This car has both the fun of a sporty vehicle with the practicality of a family hatchback. It’s really versatile and very enjoyable to drive. The Mazda3 has decent fuel economy, with 35mpg highway, 26 city and 29 combined it’s just as good for your daily commute as it is for cruising to the beach on the weekend. What I love about this car (aside from everything else I love about this car) is that it has four 5-star government safety ratings including Overall Vehicle, frontal crash driver’s side, and front and rear side crash. That means its a safe vehicle for your and your family. The hill launch assist proved to be super helpful because we have some huge hills going through the mountains near our house. They are very steep and several have stop signs right in the middle of the steep grade. The other day someone stopped at the stop sign right on my bumper while we were waiting for cross traffic. I was totally nervous (it had been about 3 years since I drove a stick shift) that I would roll backwards into the truck behind me, but the Mazda3 held strong for 2 seconds, which was long enough for me to get it into first gear and get moving. Totally awesome feature! 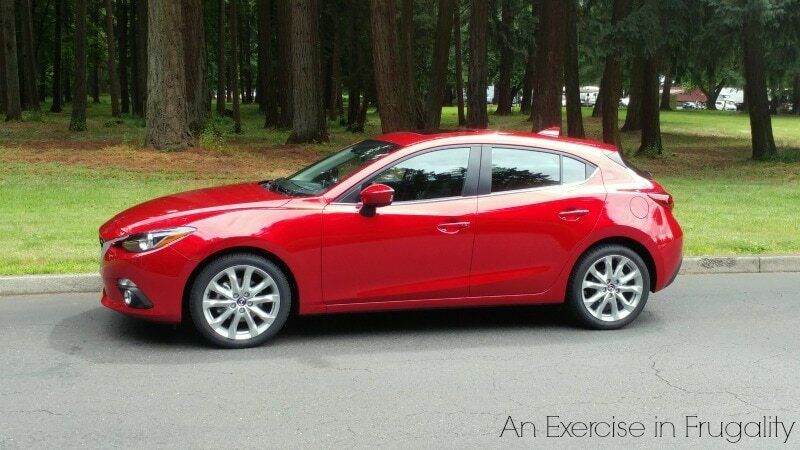 There are so many more features than what I listed, but take my word for it, if you are looking for a fun and sporty vehicle that will still haul your family and their stuff around, you’re gonna want to take the Mazda3 for a test drive. The base model S Grand Touring starts at $25,445 and mine was fully loaded at $26,980 but there are 4 other models that start as low as $17,845 so there’s an affordable range for almost anyone. 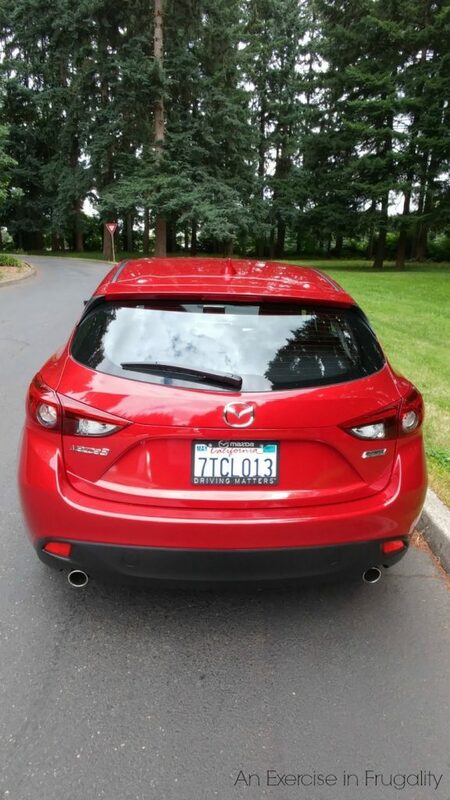 While I tend to prefer the compact SUV style of the Mazda CX-5, I found that the smaller, lighter body of the Mazda3 made for such a fun ride, I found myself overlooking the fact that I don’t normally love hatchbacks. I think this is a ride you’ll really enjoy! 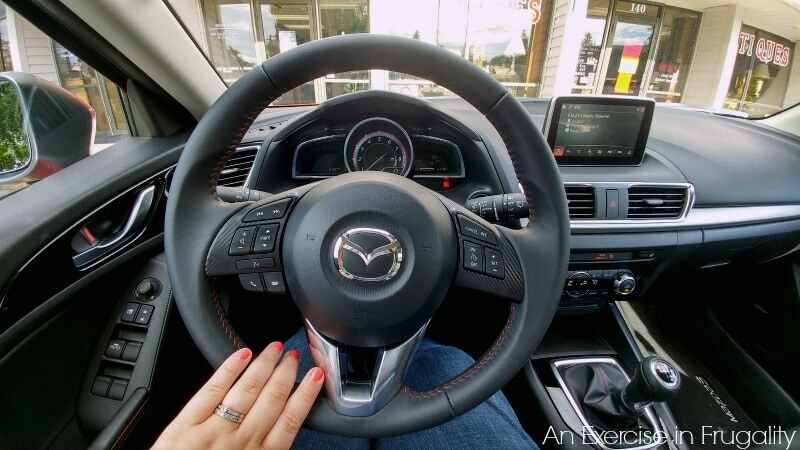 What’s your opinion of the Mazda3 S Grand Touring? Cuteness!! I’ll say it before and I’ll say it again I love Mazda’s. 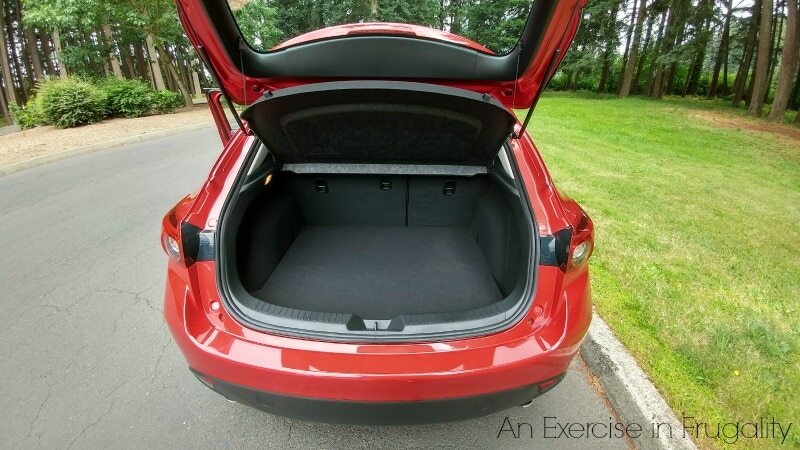 The trunk area looks like so much room I love that for such a smallish car. The red holds my fancy too! 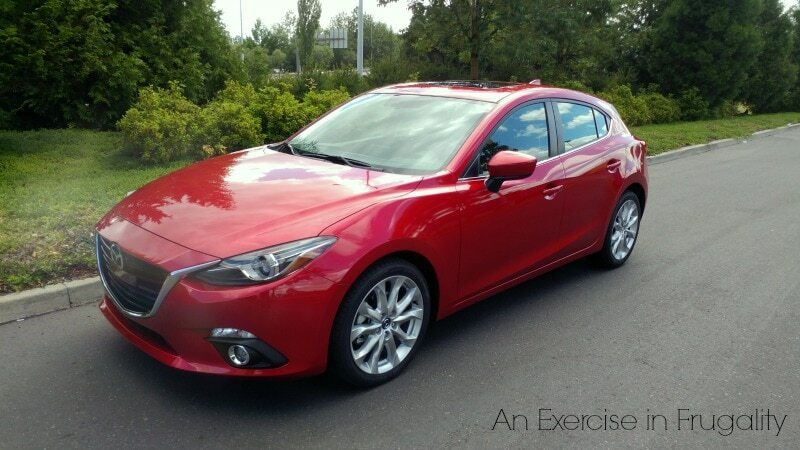 I bought a silver Mazda 3 in April – traded in my red Mazda CX-5 as I was struggling to make the payments. I was happy with the CX-5 but I must say I love the 3 because it’s so good on gas mileage. Sometimes I miss the extra room and the sun roof and I know I’ll miss the heated seats come winter but having lower payments certainly makes up for it. Sometimes I spot my little silver sporty Mazda 3 and wonder – “Is that really my car?” It looks so sporty and new and shiny. Thanks for the review. I certainly do like Mazda cars!